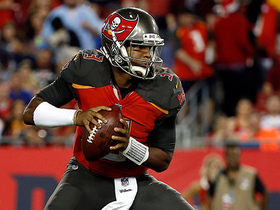 Auclair brought in all three of his targets for 15 yards in the Buccaneers' 26-23 overtime win over the Browns. Analysis: Auclair played on a season-high 22 snaps from scrimmage, a rare taste of action on offense for the second-year tight end. All four Bucs tight ends saw action in the overtime affair, but Auclair's level of participation Sunday is far from trustworthy over the long term. Auclair secured his only target for five yards and returned one kickoff for nine yards in the Buccaneers' 34-29 loss to the Falcons on Sunday. Analysis: The reserve tight end saw a rare target, but he was otherwise primarily involved as a blocker. Auclair doesn't figure for any meaningful fantasy production as long as both O.J. Howard and Cameron Brate are healthy ahead of him. Auclair brought in his only target for eight yards in the Buccaneers' 48-10 loss to the Bears on Sunday. Analysis: The reserve tight end saw some additional snaps after O.J. Howard was forced from the contest with a knee injury, and he ended up notching his first reception of the season in the process. Auclair would only have true fantasy relevance if Howard were forced to miss any time, as he's primarily deployed as a blocker despite having shown some ability to get downfield during the last two preseasons. 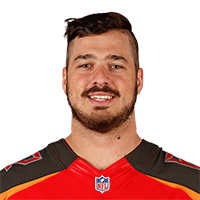 Auclair made the Buccaneers' 53-man roster, Scott Smith of the team's official site reports. Analysis: The second-year tight end snared three of five targets for 29 yards this preseason while also making solid run-blocking contributions. Auclair's impressive 6-foot-6, 256-pound frame makes him a nice-sized red-zone target as well; however, with O.J. Howard and Cameron Brate in front of him on the depth chart, he figures to see minimal opportunity in the base offense as long as the co-starters remain healthy. Auclair brought in both of his targets for 25 yards over eight games in his rookie 2017 season. Auclair will fill rookie O.J. Howard's (IR-ankle) tight end spot in Week 16 against the Panthers, Scott Smith of the team's official site reports. Analysis: The rookie from Laval University in Canada is projected for what should be his most extensive workload yet while working alongside Cameron Brate in two-tight-end sets. Auclair has seen action in five consecutive weeks, but has logged no more than 23 snaps on offense in any of those contests while bringing in both of his targets for 23 yards. All of those metrics could see a boost Sunday, with the Buccaneers' passing attack down DeSean Jackson (ankle) in addition to Howard.